1The Soleman is a versatile, highly configurable MIDI controller contained in a compact and durable housing. Use it to control any MIDI compatible hardware and software, or as the command center to your Source Audio Neuro Effects System. 2Four Footswitches—Use the footswitches to scroll through presets (ie “scenes”), launch individual MIDI messages, step through set lists, or trigger highly customizable MIDI macros. Configure footswitch functionality with any of the Soleman’s three useful control modes. 3Scene Mode—Scroll through all of the Soleman’s 128 Scenes in order with the onboard foot switches. 4List Mode—Arrange Scenes in any order and step through them in sequence. 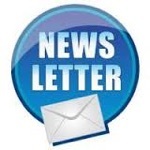 The Soleman stores up to 64 Lists, each containing up to 90 scenes. 5Panel Mode—Store up to 64 “Panels.” Within each panel, assign specific functions to each of the four footswitches like Program Change, Continuous Controller, and Note On/Off messages. Or assign multiple commands to a single footswitch with macro messages. 6Preset (“Scene”) Naming—Create custom names for individual scenes. Scene names are easily read on stage via the pedal’s high-contrast LCD display. 7Configuration Software—The Soleman is highly customizable, using the USB Editor Software that runs on Windows / Mac and connects to the Soleman via USB. 8Two MIDI Outputs—Connect to up to two external hardware MIDI devices directly to the SoleMan using the standard 5-pin DIN connectors. 9USB-MIDI Interface—Class-compliant USB drivers make the Soleman plug-and-play ready for Mac and Windows computers. 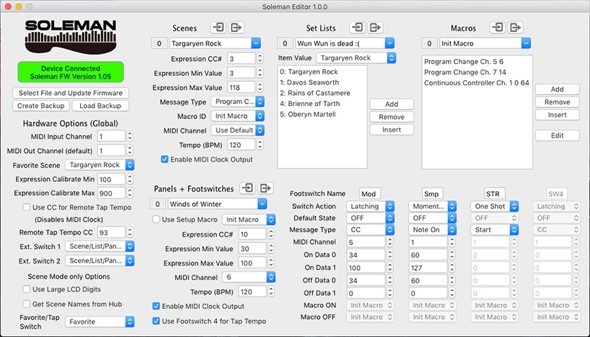 The Soleman is a USB MIDI device that can be used in digital audio workstation (DAW) software or to control software synthesizers and virtual instruments. It is compatible with built-in drivers on all supported operating systems, so no additional driver installation is required. 10Expression Pedal—The expression input accepts a passive expression pedal and converts it to Continuous Controller (CC) MIDI messages on the MIDI outputs. 11Tap Tempo—Use the Tap Tempo switch to create on-the-fly MIDI clock messages, which can be simultaneously distributed to all connected pedals, rack systems and software. 12External Switch Port—Allows for an additional two-footswitch controller to make navigation more convenient. 13Anodized Aluminum Housing—Dimensions: L: 10.5 in./26.7cm x W: 3.75 in./9.5cm x H: 2.75 in./7cm (including knobs) Weight: 2.2 lb./1 kg. 14Includes 9v DC power supply—300mA / Negative tip / Pedal draws 80mA.